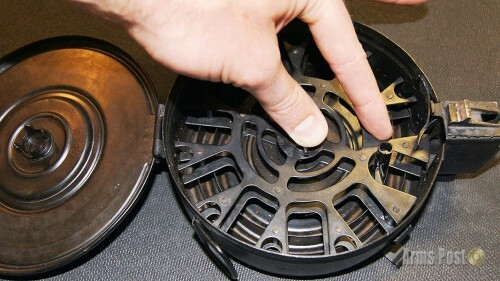 Once you understand the basic design concepts of the AK-47 Drum Magazine it will make the process of loading one extremely simple. 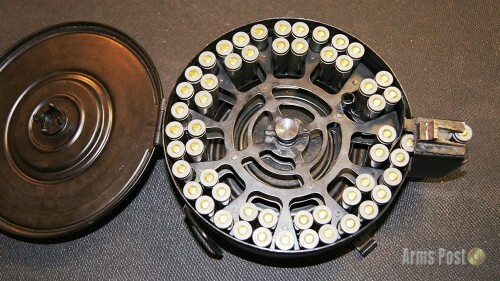 The images will take you step by step through loading the Drum Mag and we have also included an instructional video on loading it. 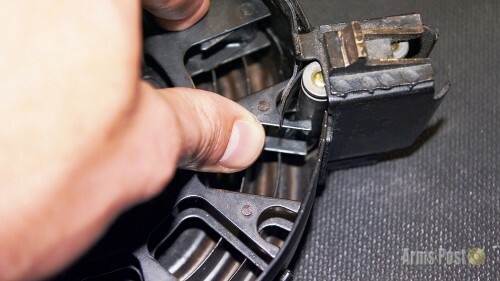 Any time you open the drum’s cover to add / remove rounds or work on it in any way you need to release the spring tension first! Be careful when pressing down on the spring’s tension release button! We recommend using an instrument that keeps your fingers away from the rotating metal prongs. 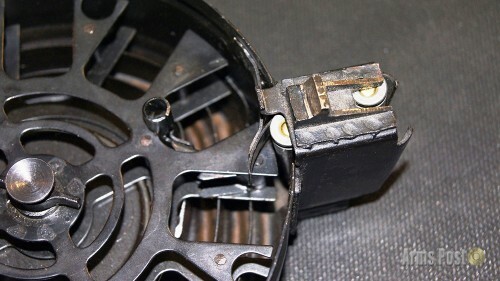 If there is tension on the spring these prongs rotate fast and will cut you. Step 1 – Release tension from the spring by pushing down center post. DO NOT USE YOUR FINGER! If you watch the video you will notice that we use the handle on a pair of metal scissors to press the tension release. The importance of not using your finger is that if there is tension two metal spurs will release quickly and rotate just below your finger. Chances are good those spurs will cut you. 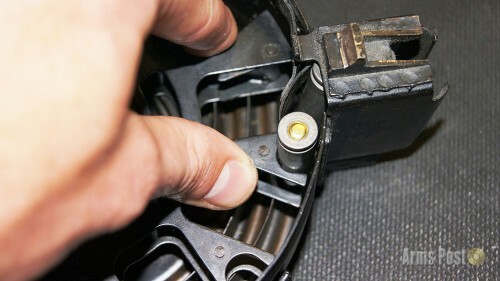 Step 2 – Locate the follower, in this picture the follower is located in the outer most ring of the drum. 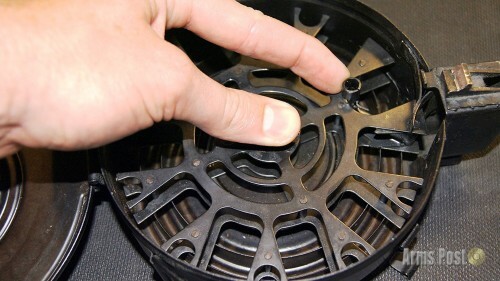 If you inspect the design of the drum you will notice there are three rings or levels that feed from the center out. Since the tension was released in step 1 it is now safe to use your finger. You will need to push down on the center post and start rotating the follower in a clockwise direction. 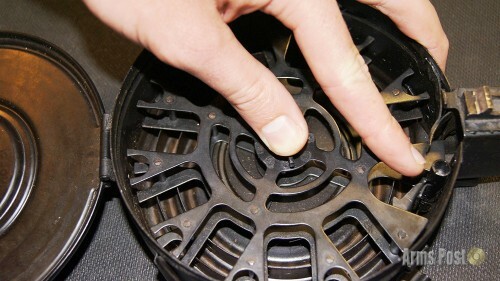 Step 3 – Continue to press down on the tension release button and rotate the follower clockwise. You will notice it has entered the middle ring of the AK Drum in this picture. Step 4 – Continue the process above, the follower has entered the inner most ring, but has not seated itself yet. Step 5 – The follower has now come to a stop. Step 6 – This sounds stupid, but double check that the follower is fully seated. 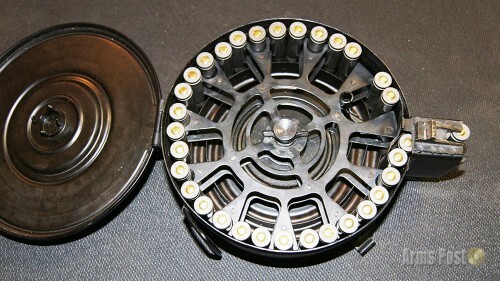 Step 7 – Load three rounds into the drum. 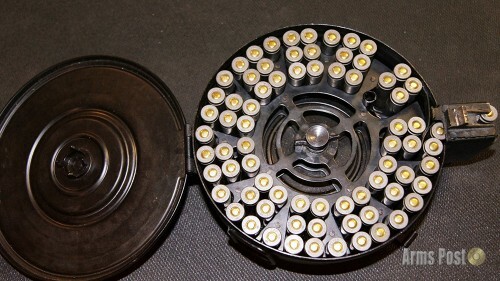 Use the image as a reference for the location of those rounds. The first two rounds fit in the double slot and the third in it’s own private slot. 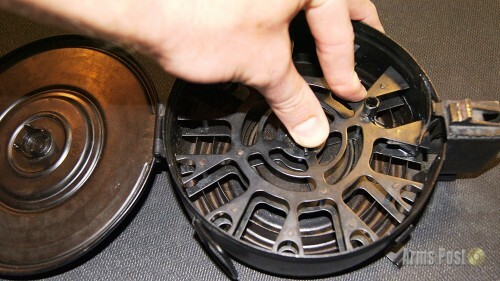 Step 9 – Make sure you rotate all three rounds out of the drum rings! Step 10 – Once those rounds are seated you will press down on the tension release button again and rotate the follower clockwise back into the fully seated position. Make sure the rounds do not come back into the drum. Once the follower is fully seated you will see there is a tab that actually blocks those three rounds from dropping back into the drum. 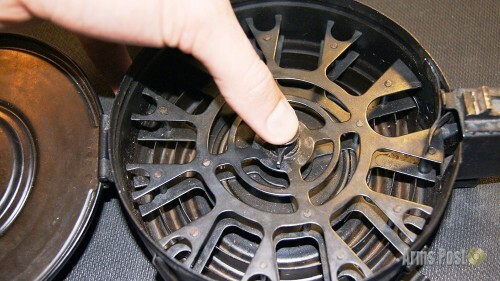 Step 11 – Proceed by filling the outer most ring of the AK drum making sure not to skip any slots or wholes. If for any reason you did not want to fill the drum to capacity you could stop here and skip to step 14. 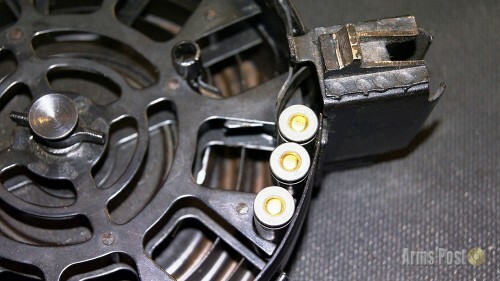 Step 12 – Continue by filling all the slots located on the middle or second ring. Step 13 – Fill the inner most ring. You will notice that the follower takes the final position. Double check that your follower is acting as the final round and that drum looks like this. Step 14 – With the final step you can choose one of two options. 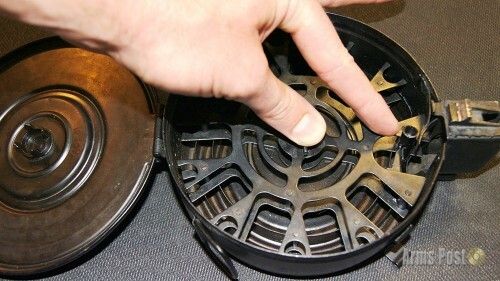 If you are planning on storing the drum you should only close the cover and snap the clasps shut. 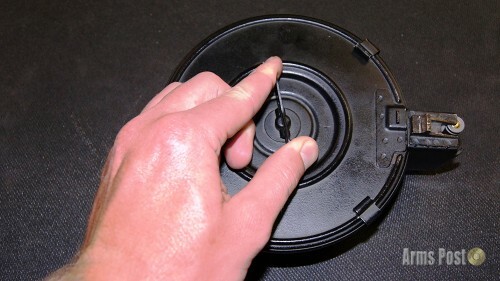 On the other hand if you are going to shoot your AK using the drum you will need to close the cover, snap the clasps shut, and start rotating the tension knob clockwise. Once you have the drum fully tensioned you are done.